Many online mega-retailers have discovered that 360 product images significantly boost product engagement and sales while reducing return rates. Unfortunately many shopping cart systems available to small and mid-sized businesses only allow static images be used on their product pages. Imajize solves this problem. Now you can easily integrate the Imajize 360 product viewer within your BigCommerce product pages! With BigCommerce, we have two possible integration methods. This will add the 360 product image into the description area of a product page. First, log into the admin area of your BigCommerce and click "Products". Select the product you want to add the 360 to. Scroll down to the description editor, and click on the "Insert/Edit Embedded Media" button in the toolbar of the editor. 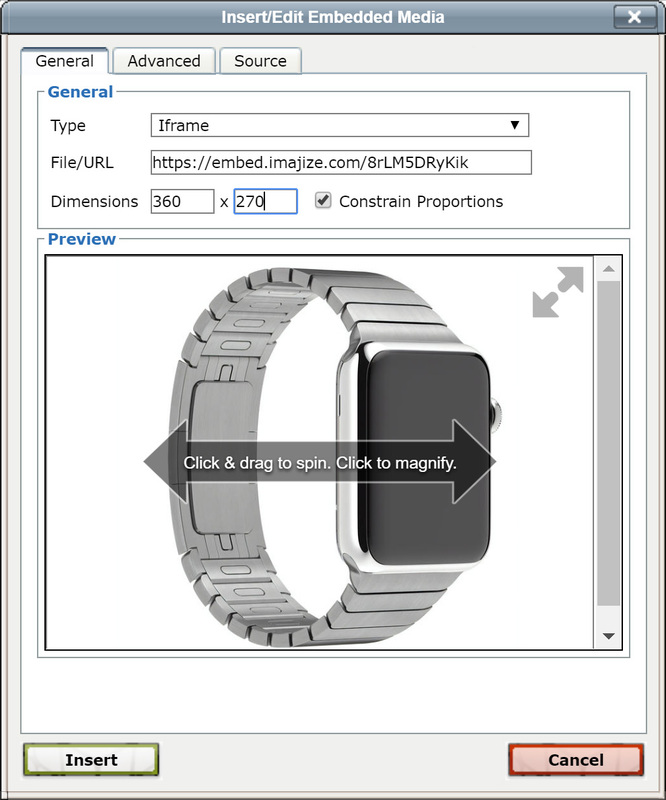 You can try using the above URL or any other URL that Imajize provides you with by logging in to Imajize, going to your 360 view, and clicking on "Embed" > "URL"
This will allow you to replace the current main product image with a 360 product view. Scroll down to the description editor, and click on the "Insert/Edit HTML" button in the toolbar of the editor. Note: Due to differences in the themes provided by BigCommerce and third-party developers the code above may need to be modified to fit your specific implementation. The code above was made for the default Cornerstone Light Theme (version 2.0). If your 360 product image doesn't appear immediately then please send us a link to your 360 product page and we will find a solution. Usually within 24 hours. Also, If your theme already uses JQuery then you can remove the reference to JQuery.